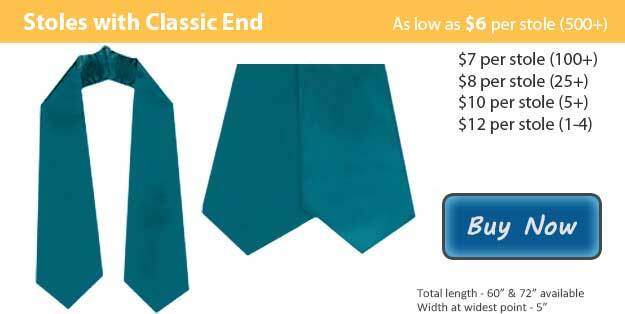 Add a bright, cheerful shade to your school's commencement attire with our teal graduation stoles. The color teal is correlated with trustworthiness and reliability, which are both wonderful associations to accompany the ceremonies of commencement. Additionally, it is very closely related in hue to peacock blue, which can represent graduation achievement in several degrees. Some of these include foreign service, government, public administration, personnel services, and public service. Otherwise, it may simply be part of your school colors, and is a perfect way to complete your school's celebrations. As far as utilizing graduation stoles goes in general, regardless of color, there are a variety of purposes that will heighten the symbolism and dignity throughout your commencement. You may wish to use them to indicate student involvement in extracurricular activities such as band, choir, or sports. You can also use them to show students' high academic achievement because of percentile or grade point average above a certain point. If you have certain rigorous programs at your school such as International Baccalaureate or a fine arts or engineering curriculum, you may use the honor stole to set them apart in their accomplishments. Whichever purpose for which you are adding teal honor stoles to your graduation, you can know it will be beautifully accomplished when you make your purchase through Honors Graduation. Our honor stoles are made of fine crepe back satin, and the high quality will stand out among your graduates. At the same time, they also come at an incredibly affordable price that will work with your budget. This is particularly the case if you take advantage of our bulk discount deals! Order with Honors Graduation today for teal honor stoles to help make your graduation day even more unforgettable!